Increase Sales? Grow Your Guitar-Related Business? Now you can take advantage of our extensive knowledge and experience to get a straight-forward review of your sales and marketing strategy (if one exists or not) and receive simple, but solid recommendations on how to start taking your business to the Next Level. Typically this kind of consultative service would cost many hundreds of dollars. 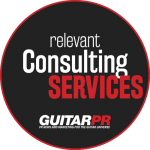 But, because GuitarPR is known for its thoughtful structured services, we offer our Sales & Marketing Tune-Up for just $199. We also have an Expanded Tune-Up for $499 when simply more time is required. Contact us if you are uncertain. You can order this service on our Structured Services page.